This recipe has become a favorite of mine, not only is it healthy, but it combines two of my favorite things: Thai food and meatballs! I had never heard of mixing zucchini in a meatball, but it works perfectly with the ground turkey (which tends to be dry) and keeps the meatballs nice and moist. Just be sure to really squeeze all the liquid out of the zucchini after you shred it! Be sure to use a large pan too, I ended up having to cook the meatballs in two separate pans because I couldn't fit them all in one, which was fine, but its always better to know that ahead of time (in my opinion) so you're not scrambling for a second pan in the middle of the recipe. 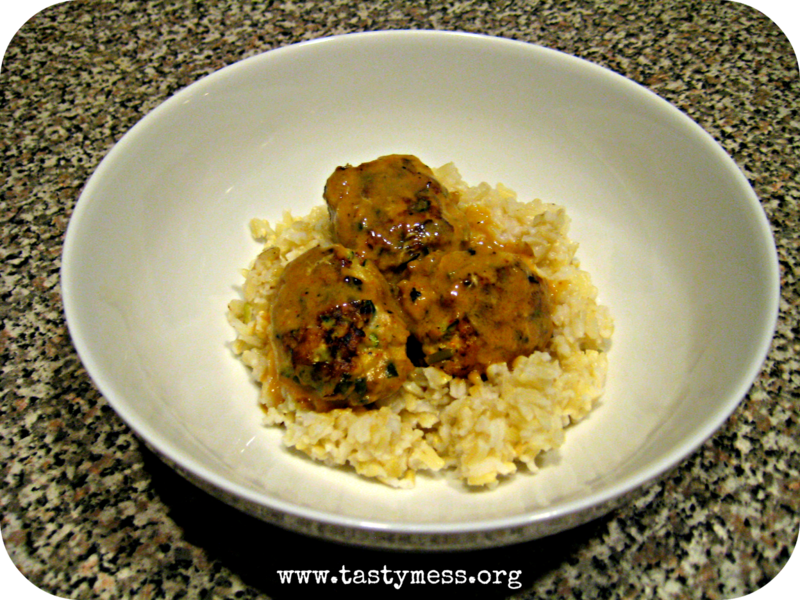 These meatballs are perfect served over rice or egg noodles! In a medium bowl, combine ingredients for meatballs, mix with your hands thoroughly. Make 28 meatballs by spooning heaping 1 tbsp of mixture and rolling between your hands. Lay on a cutting board or plate. Set aside. Preheat large, 12" or larger, skillet on high, spray with cooking spray. Add meatballs and cook until brown, for about 2-3 minutes. No need to cook the meatballs through. Add the sauce, reduce heat to medium and simmer for 15 minutes, uncovered. Serve warm with brown rice or brown rice noodles. Add garnish like fresh cilantro and green onions.